Pictured above: A fleet of six long-range autonomous underwater vehicles and a Wave Glider sit on the dock by R/V Rachel Carson prior to deployment. Tourists flock to Monterey Bay to capture glimpses of the abundant sea life that inhabit the region. But it was a fleet of robotic vehicles that attracted many scientists and engineers to the bay in April and May of 2017. Together the researchers planned and witnessed the deployment of the one of the largest fleets of autonomous vehicles ever deployed in Monterey Bay. These vehicles are an integral part of what the future holds for ocean observing and research. Our understanding of how marine communities function, and our ability to predict their dynamics, is critical to appropriately managing these resources for future generations. What’s so special about fleets of robots? In short, they allow researchers to observe multiple places at the same time and can be programmed to track down areas undergoing interesting activity such as phytoplankton blooms. Historically, oceanographers have used ships to repeatedly sample the ocean at predetermined locations over given time intervals. Scientists call this a repeat profile and it makes up the backbone of our understanding of ocean health. By taking routine samples researchers can understand how the ocean changes from season to season and from year to year. Ultimately, these critical measurements provide the necessary details to assess the causes of observed changes over different timescales. These multi-institutional, multi-vehicle experiments have occurred in Monterey Bay, California. These time-series approaches have worked well for physical properties such as temperature and salinity, where directional changes are relatively uniform over multiple scales. 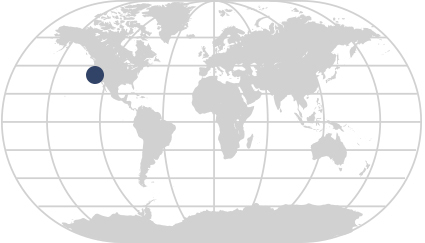 For example, measurements of such properties at MBARI’s three time-series sites at the sea surface, separated by about 50 kilometers in and just outside of Monterey Bay, are highly correlated with each other and with large-scale climatic phenomena like El Niño (a recurring warming trend in the equatorial waters of the Pacific that causes a cascade of global impacts in precipitation, temperature, and winds). But things are not so straightforward when it comes to biology, where important variables such as chlorophyll and primary production are weakly correlated over scales of a few kilometers and with El Niño. The inherent reason for the disconnect between physics and biology is the patchy nature of biology in both space and time. The biological response to a physical change, such as an injection of nutrients resulting from wind-driven upwelling, lags in space and time compared to the initial perturbation. Complicating matters further, the rate of such a response is variable and dependent on a wide variety of factors, including which microbes and predators were originally present when it first occurred. The constant movements of organisms and predators adds a further dimension to “patchiness” as complex communities of species aggregate in locations that are favorable for growth, survival, and reproduction. Our understanding of how these communities function, and our ability to predict their dynamics, is critical to appropriately managing these resources for future generations. Conventional ship-based, low-resolution sampling schemes are insufficient to wholly capture the realities posed by “patchy biology” in the ocean. More often than not, research expeditions will miss hotspots of biological activity since it’s not possible to linger at any location for very long, and observing the ocean in multiple places simultaneously is logistically challenging and very expensive if ships are used as the primary sample collection platform. This realization has spurred a new generation of scientific inquiry and technology development that is needed to characterize varying ecological processes on a large scale. At MBARI, this catalyzed the start of a multi-disciplinary initiative named CANON—for Controlled, Agile, and Novel Observing Network—in which a variety of research teams with different expertise use fleets of mobile autonomous vehicles to follow ecological processes over time and space—something that can’t be accomplished using the historical approaches. Scientists have long surmised that particular regions of Monterey Bay were hotspots of biological activity for the prey of fish, sea lions, and whales. Before the advent of these smart vehicles, scientists had to select specific locations to focus their attention, and as a result they were missing much of the ephemeral action that sustains life in the sea. The new vehicles have changed that equation dramatically and are helping scientists understand cause-and-effect relationships that tell us why large fish and marine mammals congregate in specific areas of the ocean. 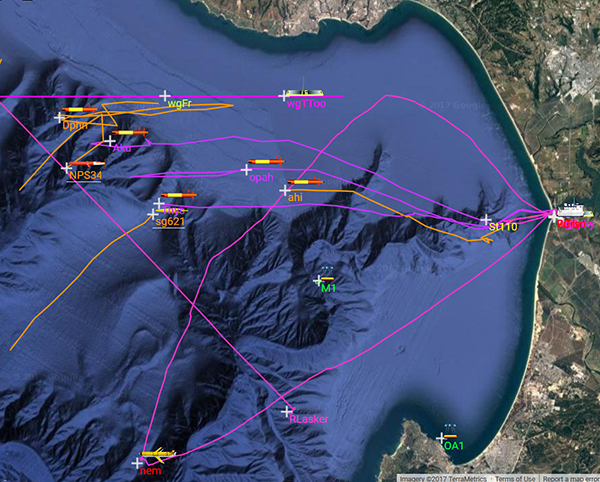 The positions of the autonomous vehicles (AUVs and gliders) in the fleet are shown in Monterey Bay during the 2017 experiment. This image is from MBARI's Oceanographic Decision Support System (ODSS), which allows researchers on shore to follow the vehicles in real time. During 2017 the CANON group teamed with a large group of researchers (see list below) in a study that utilized the new fleet of robots to find and study frontal regions—areas where different water masses abut. Like weather systems in our atmosphere, fronts frequently develop in Monterey Bay when cool, nutrient-rich water is brought to the surface by wind-driven processes and infiltrate the surrounding warmer waters. These fronts are known to be regions of enhanced biological activity, and because of their size and short-lived nature are perfect examples of the types of important processes that are often missed using the traditional time-series study approach. A little like ocean “stormchasers”, the vehicles were programmed by engineers to autonomously locate and follow the fronts, providing information for two ships, MBARI’s Western Flyer and NOAA’s Reuben Lasker, to target sample collections along the fronts with both traditional and emerging methods for surveying biological communities. Researchers aboard the Reuben Lasker were conducting an annual survey (using nets and acoustics) for rockfish larvae to provide an estimate of that fishery’s population. Aboard the Western Flyer, MBARI and Stanford University scientists were collecting samples for analysis of environmental DNA (eDNA)—bits of genetic material shed naturally by animals in the ocean—as a complementary and promising new technique to survey the same biological communities that the NOAA scientists were after. The vehicles performed remarkably well in finding and following the fronts, leading the ships to the correct locations for collecting samples with surgical precision on different sides of the fronts. The team was also able to collect eDNA using autonomous vehicles equipped with the Environmental Sample Processor (ESP). During the same cruise researchers compared—for one of the first times—the ability of these vehicles to collect samples to ship-based sampling methods. The initial results of this investigation suggest that vehicle-collected samples are similar to those from the ships. This opens a new window into sample collection over large areas in the sea if future sampling can be done with robotic vehicles instead of always requiring ships and their crews. 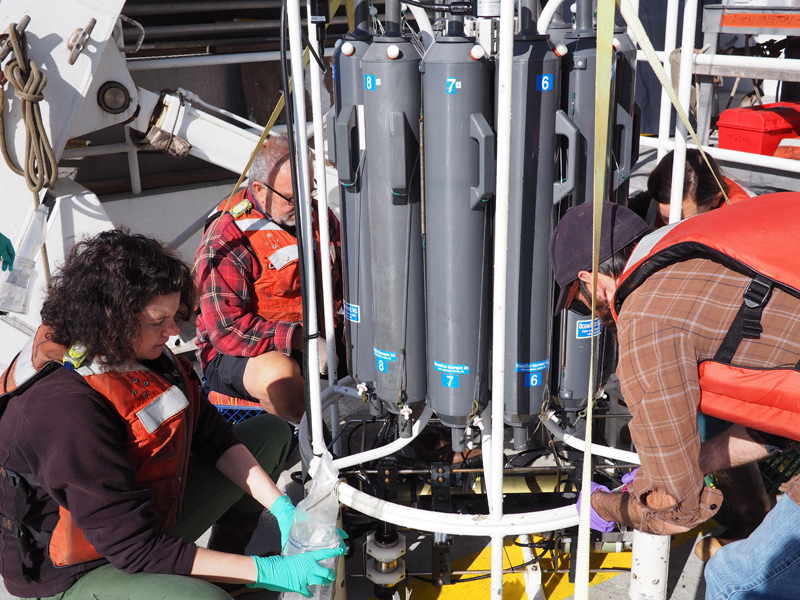 MBARI researchers aboard the R/V Western Flyer draw samples from an instrument called a CTD rosette—a device that measures the water conductivity (salinity), temperature, and depth. Each gray cylinder contains seawater that has been collected at a different depth in the water column. Photo by Meilina Dalit. While the CANON initiative has had a continuous string of successes since its inception more than a decade ago, much more work remains to be done. The addition of acoustic backscatter sensors to mobile platforms will allow for characterization of the forage community in a manner not possible before. This forage community, which includes large copedods, krill, and small pelagic fish, is key in the transfer of energy from microscopic plants to large predators, including commercially important fish and humans. An important future development will be the linking of CANON-like capabilities for observing foragers with the capabilities for observing large predators. The ability to autonomously operate fleets of seagoing robots to survey the water column intelligently and seamlessly is on the horizon. Increasing vehicle reliability will be one key aspect of realizing that vision. The massive collection of information by the autonomous fleets will continue to lead to improvements in our scientific understanding of how ocean ecosystems are structured and evolve over time and space, and how that ultimately benefits vibrant ocean ecosystems and human well-being. Chance discovery of dead whale at the bottom of Monterey Bay leads to a 15-year study of new genus of deep-sea worms.